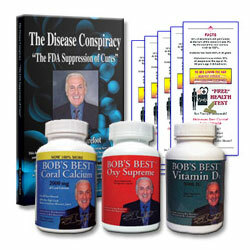 The Clinical Studies Documenting How Vitamins and Minerals are Essential to your Health. • The Incredible New Book by Robert Barefoot - The Disease Conspiracy! A COMPLETE INFORMATION AND NUTRITION PACK - Read the Book, Supplement with these high quality nutritional supplements and feel the difference!